Glad to see you are planning your trip to Romania! 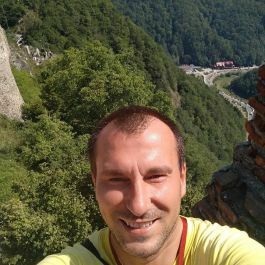 My name is Vlad and would be delighted to introduce you to the secrets of our beautiful country. . . Yes, I love my country. I am proud of it and I am sure of the fact that we live in a beautiful place. I want to show you the reasons I love it. . . and who knows, maybe even make you too fall in love with Romania! I have traveled with hundreds of groups and made thousands of new friends while showing them the beauties of our country. Contact me, let's plan your trip together and you will become my new friend! I also love my job - I am an authorized Romanian Tour Guide (by the Local Authority for Tourism). I can provide both Private and Group Tours guidance for tourists visiting Romania. I speak fluently English, Spanish, Italian and Turkish. I am passionate about history, geography, traditions and of course, meeting new persons. I own a 2008 Volkswagen Touran, 7-seater comfort car. Besides the tours listed here, we can discuss in detail your trip to Romania, and establish the most interesting itinerary according to your interests and, of course, your available time.